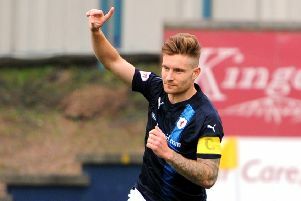 Goalscorer Euan Murray insists Raith Rovers can take positives from the 3-1 defeat to Hibs in the fifth round of the Scottish Cup. Rovers were three goals down inside an hour at Easter Road but a battling finish from the Kirkcaldy side saw Murray head home a consolation goal with 12 minutes remaining. "The second half performance showed there's spirit and character in the team," he said. "We gave it everything and when it goes to 3-1, I've got another header that just goes past the post, and if that goes in, it would have been a nervy last few minutes for them. "We knew it would be very hard for us. They've got a million pound striker up front in McNulty and the boy Slivka was at Juventus. "We lost goals at a bad time when we were starting to come into the game, but I still think we gave a good account of ourselves. "The last 20 minutes were the best we played the full game, which is credit to the coaching staff and fitness side of things because a lot of League One teams would come here, get to 3-0 and the legs could go. "But we battled right to the very end." The defender now hopes the team can kick on when League One business resumes in a must-win match at home to league leaders Arbroath this Saturday. "There's a massive game next week and the most important thing from now until the end of the season is to claw back as many points as possible and get ourselves back in the title race," he said. "If we can't do that then we need to go up through the play-offs." Rovers boss John McGlynn was pleased that his team refused to cave in at 3-0 down. "It was a big step up for us and we just didn't get to grips with it early enough," he said. "I'm reasonably proud of the way we played in the second half, and that we didn't go on to get embarrassed. "They stuck together, showed good spirit, kept going, got a goal back, and grew into the game. "It's a learning curve for players in our team who aspire to play in the top league." McGlynn also paid tribute to the 1700 Rovers fans who made the trip to Easter Road. "It's amazing and I can't thank the fans enough," he said. "We put everything into the preperation and tried our best to win the game. "Although it's a defeat I hope the fans enjoyed the day."